If President Trump is forced out of office the V.P. becomes President and the Speaker of the House becomes V.P. If Pence is forced out after he became President Pelosi would become President. In this situation, Pelosi would name a V.P. of her choice, subject to majority approval by both houses of Congress. Gerald Ford and Nelson Rockefeller are the only examples of this in our history. I think that the Left knows it cannot defeat Donald Trump in November 2020. They will never admit this but everything they are doing is aimed at destroying his Administration and as many of his family and supporters they can, even if it happens after he is re-elected. Note: I consider the Left to be almost all Democrats, the RINO Republicans, and the MSM. They are all eager participants in the detailed traitorous plan to take the White House away from those of us that elected Donald Trump. A look at some facts proves that this is happening, and the Left is no longer concerned about what they are doing being unethical, illegal and in some cases Treason. As noted in my article last week the first part of the Merriam Webster definition of Treason is: “the offense of attempting to overthrow the government of one’s country”. I am not the only person who thinks that the Left knows it cannot defeat President Trump in November 2020 but will never admit it. Rush Limbaugh talked about this at length on his radio show one-afternoon last week, and I have heard other people talk about this on Fox News. California, including Los Angeles County, is being forced to clean up their voter registration rolls as a result of the settlement agreement of a Judicial Watch lawsuit against them. California and many of its counties have refused to clean up their voter registration rolls even though it is required by the National Voter Registration Act (NVRA). The NVRA requires states and counties to remove voter registrations when the voter does not vote in two consecutive general federal elections. These are usually people who have moved to another county or state or have died. It is interesting to note that Los Angeles County has a total population that is larger than the total population of 41 of our states. Judicial Watch reported that Los Angeles County has more people on its voter registration rolls than it has citizens old enough to vote. These numbers are the reason the Left is so obsessed with getting rid of the Electoral College and letting illegals vote. Accomplishing either of these goals will guarantee that a Conservative Republican will probably never win a national election again and America will become a one-party Socialist country. The Democrats took the first step in getting illegals to vote recently when they passed legislation in the House that made it easier for people to commit voter fraud. After the bill passed Pelosi and other prominent Democrats went on record publicly encouraging illegals to vote whenever they could. The Democrat Party position is that everyone should be allowed to vote in local and state elections! NVRA prevents illegals from voting in national elections (for now) but the state, county, and municipal elections are not regulated by the NVRA! Ayanna Pressley (D-Mass) proposed an amendment to HR1 that would change the legal voting age to 16! People who are 16 years old are usually less informed about politics than people who are 18 and more easily influenced. People who are 16 years old usually have two more years in school which makes them prime targets for liberal educator’s indoctrination. Rep Schiff and his staff made four trips to N.Y. City to meet with Cohen and his “Clinton Fixer” lawyer, Lanny Davis to prepare Cohen for his testimony before Schiff’s committee. Schiff initially denied this but when it became public (thanks to Fox News) the Democrats issued a public statement insisting that this was perfectly OK and was “Standard Operating Procedure” in situations like this. I am now absolutely convinced that the Democrats are colluding with Cohen to get him to say what they want him to say in exchange for reconsideration of his pending prison sentence. The recent release of the transcript of Bruce Ohr’s testimony before a congressional committee proves without any doubt that Rep Schiff and other Democrats lied publicly and colluded with top FBI and DOJ officials to influence the election and later to try to impeach President Trump. Ohr was an Associate Attorney General at the DOJ and is just one of the top FBI and DOJ officials who have been fired or forced out of office since President Trump was sworn in for inappropriate and/or illegal behavior while in office. Tom Perez, the Chairman of the DNC publicly announced that Fox News would not be allowed to host any of the 12 scheduled Democratic Presidential Candidate debates, “because they are not a news organization”. I do not believe that any other media organization has a potential debate moderator team that is as honest, balanced, knowledgeable and professional as a Bret Bair, Martha McCallum, and Chris Wallace team would be and has been in the past! Every House committee and sub-committee chair is dramatically ramping up investigations of “everything Trump” and spending many millions of taxpayer dollars in the process. Nadler and Rep. Schiff are two of the most aggressive chairs. Schiff even hired a former federal prosecutor and recent MSNBC legal analyst to “lead his committee’s investigations into Trump’s Russia collusion”. Paul Manafort, Roger Stone, General Flynn, and their family’s lives have been totally destroyed based on Mueller investigations that had nothing to do with the Trump campaign and were way outside Mueller’s special prosecutor mandate. Mueller and his staff covered this up by referring these prosecutions to state prosecutors. John Podesta, Bill Clinton’s Chief of Staff and Hillary’s campaign chair, and his brother Tony did some of the same things Manafort has been convicted of but no one seems to be concerned about that? Manafort has been held in federal prison in solitary confinement pending sentencing for FINANCIAL CRIMES! His initial sentencing was earlier this week. He was sentenced to 4.7 years in federal prison. His health has deteriorated to the point that he will most certainly die in prison. When the sentence was announced the Democrats immediately began to loudly and publicly say that the length of the sentence was an “outrageous miscarriage of justice”! They insisted that it should have been much longer! Tlaib held a press conference this week to announce that she was going to introduce a resolution calling for Trump’s Impeachment. The Democrats refused to say that anything Rep. Omar has said or done has been wrong or out of order. All you have to do to see that this is not right is log into the internet or turn on a TV! Instead of condemning Omar in any way the Democrats passed an “all-encompassing” bill condemning all forms of hate speech or discriminating behavior by anyone. This was an absolute and unnecessary waste of legislative time and taxpayer dollars! 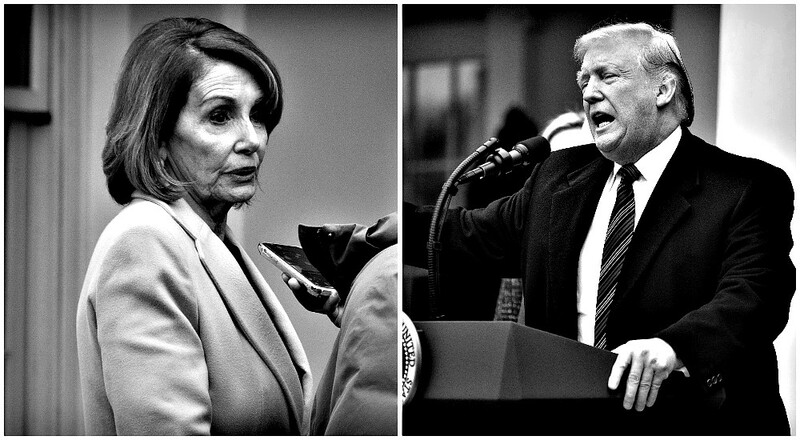 Post Script: In a press interview with The Washington Post on Monday, March 11, 2019, Pelosi said she would not pursue impeachment against Trump because he “was not worth it”. However, she left herself an “out” when she said, “unless there’s something so compelling and overwhelming and bipartisan”. She is also letting all her House committee chairs continue to waste millions of taxpayer dollars and thousands of legislative hours digging for dirt on the Trump administration. It appears that she had to make this statement because Mueller is about to end his unethical and illegal investigation with nothing to show for it! The radical wing of her party is openly rebelling against this.